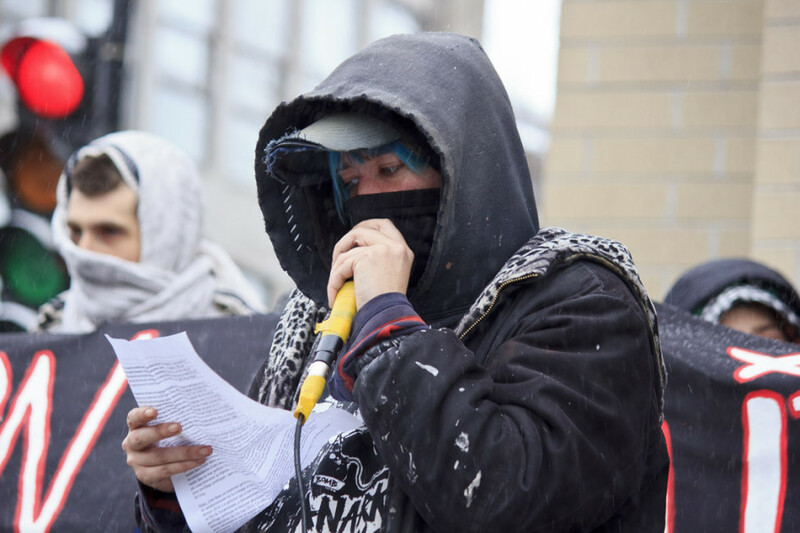 Around 150 protesters came together outside of Berri-UQAM Metro to protest against the lack of police accountability on Sunday. They carried large banners and signs sporting familiar slogans. In many ways, the protesters were entirely average: mainly white locals, students, some older folks and a ton of press. 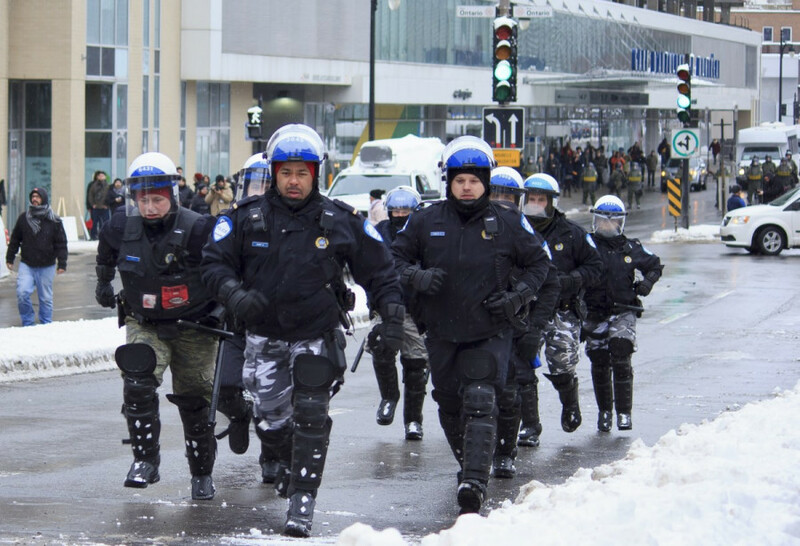 The thing that set this protest apart from your average Montreal peaceful demonstration was the police. They were everywhere. 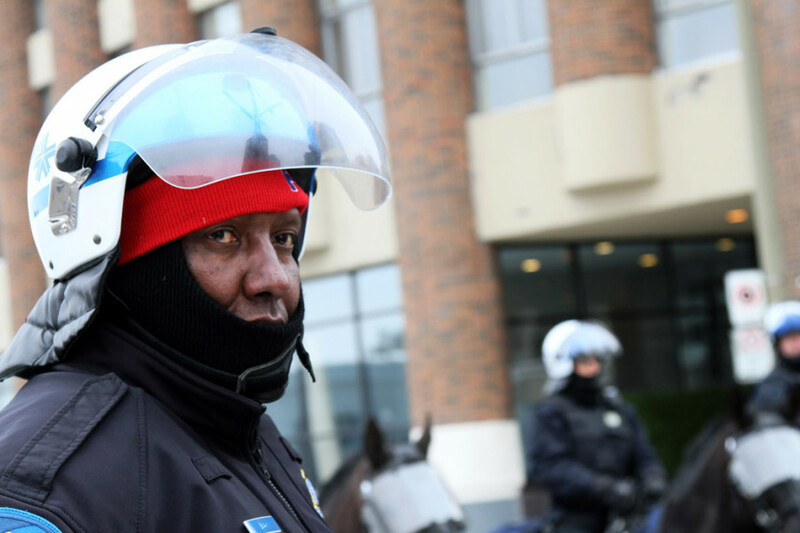 On horseback, in riot gear, wearing black aviators behind their riot masks, clutching their shields and huge teargas blasters as they marched in lockstep and lined the streets. Dozens of cruisers circled the block and barricaded exits. Two choppers, emblazoned with the SPVM logo, hovered just above them. This was the Anti-Police Brutality March, and the entire city seemed to have been waiting for it. 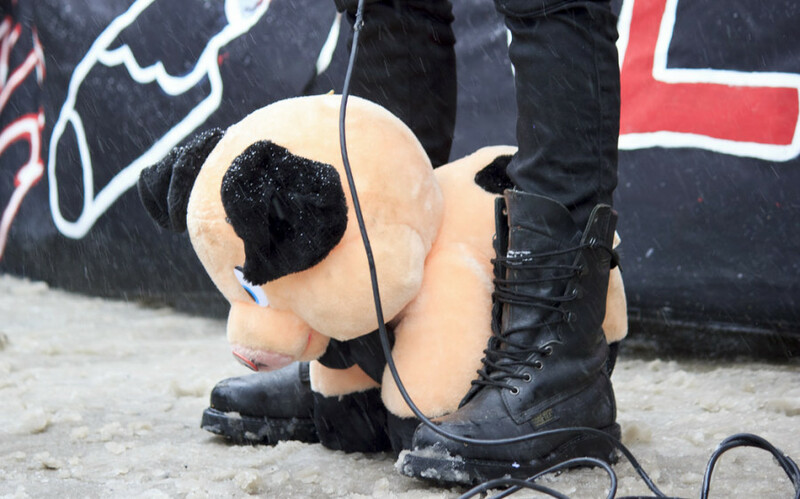 In the looming shadow of the student strike, which brought the city to a grinding halt just three years ago, tension has only been growing between civilians and the police in recent months, seemingly coming to a head with Friday night’s discovery of a pig’s decapitated head in the centre of a pentagram on the front steps of the SPVM. 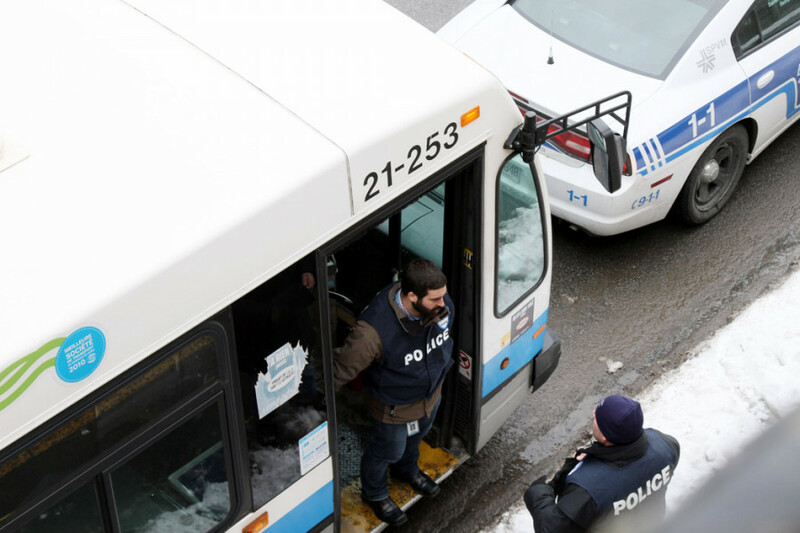 With Sunday’s showing of police might (at least six armored cars circled the protest), Montreal’s force were prepared for the worst. What they got, though, was nowhere near the worst. The entire protest began with a stern warning from police loudspeakers, reminding everyone that the protest had not chosen a route and, therefore, the protesters would be subject to arrest if they began to march. Of course, this is exactly what they did, immediately starting down Ontario, only to be turned around by a wall of riot shields. The small group quickly shifted around, made a quick left on Berri and began to rush up the street. Before they even made it under the bridge, more police shields and riot armor appeared. Less than half an hour after the demonstration began the protesters were kettled and remained there, exposed to the elements without food or water, for over two hours. Despite both the weather and the fact that they were each staring down the barrel of a $500-plus ticket, the newly kettled dissidents kept their spirits up. Around them, sympathizers shouted encouragement and threw candy down, much to the protesters’ delight. The riot police remained stoic, only breaking their silence to usher out news media, which they did frantically, as though they had been coached. Eventually the fateful STM buses rerouted to “Special” arrived, and the protesters, including any independent media, like The Link, unlucky enough to have an unconvincing press pass, were herded aboard their chariots to be processed. 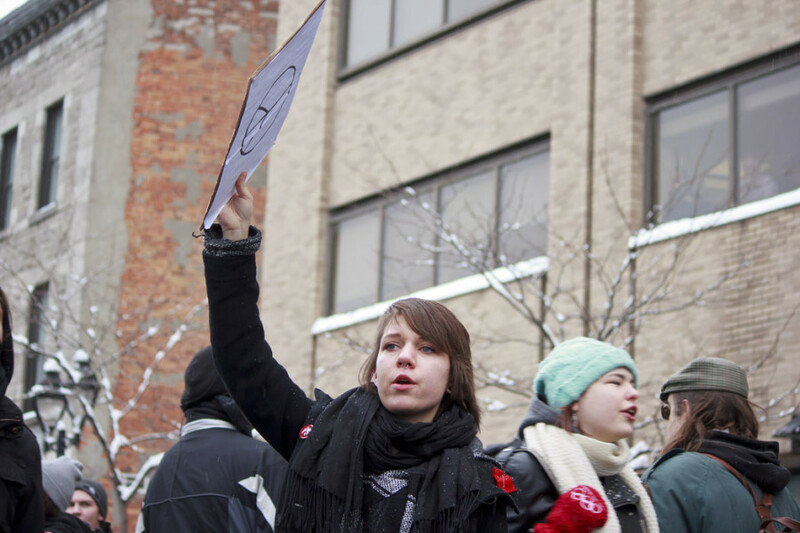 Before he was herded away, a student protester named Paul Thibodeau informed the crowd that this wasn’t his first rodeo. “[I’ve been in a kettle] like 30 times!” He and a friend laughed like they’ve said it before. “We will be arrested; it’s the point. It’s exactly what happens every year. Every year, it’s the same. We’re doing nothing; we get arrested. We’re not dangerous people. The cops don’t care at all. They’re almighty, and that’s why we can’t do anything. The media will say that this year’s a good year because no property was damaged.” He and his friend laughed again, gazing around at the police blocking them in on both sides. The choppers buzzed overhead.